Gone are the days of carrying around annoying city guides made of actual paper while you’re travelling, there are now all kinds of apps and services for your mobile that’ll tell you the best places to stay, visit and eat at the touch of a button. However, it can be hard to draw all of that important information together in one place, which is why Stay.com aims to be the one-stop-shop (or one-stop-app) for all of your travel needs. The Stay.com team has specialised in web-based travel guides up until now, but from this week provides travellers with top notch city guides all from their phones. Users can gather together all of the information they want about certain cities in the form of an interactive map by downloading guides full of really useful information about attractions, restaurants, hotels and all kinds of other places of interest. All of the data is collated from Stay.com’s travel experts, real-time information from Google Places, TripAdvisor and TimeOut and reviews from other travellers and friends. 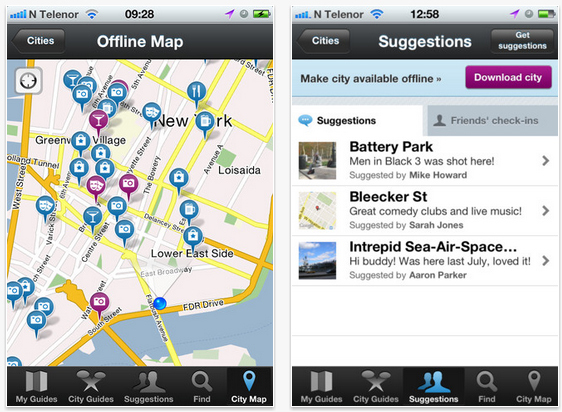 So far 116 cities worldwide are included in the Stay.com app with more to follow over the coming months. You start by picking a destination, reading reviews and information, then adding the bits that interest you into your own customisable guide. The feature that makes Stay.com stand out against other similar apps is that you can add things, browse your guide and discover new places to visit all without an internet connection, so don’t worry about racking up expensive roaming charges while you’re abroad. All of the maps within the guides take up less than 5MB and allow you to pan, zoom and swipe around cities and they’re always available offline too. Of course there’s integration with Facebook, which allows travellers to request suggestions from friends, invite people to collaborate and even travel together so you can all access the same guide at once. “We are thrilled to offer users a better way to plan trips and travel on both web and mobile. There are already a lot of different apps out there that have been created to collect together reviews of destinations, hotels and restaurants, which you’re probably already used to using. However, Stay.com is a great option if you want to combine everything together in one place and view it on a handy interactive map. Of course there's integration with Facebook, which allows travellers to request suggestions from friends, invite people to collaborate and even travel together so you can all access the same guide at once. This phone application is very helpful and an instant guide when traveling. It definitely eliminates the need for bringing maps and hiring tour guides.